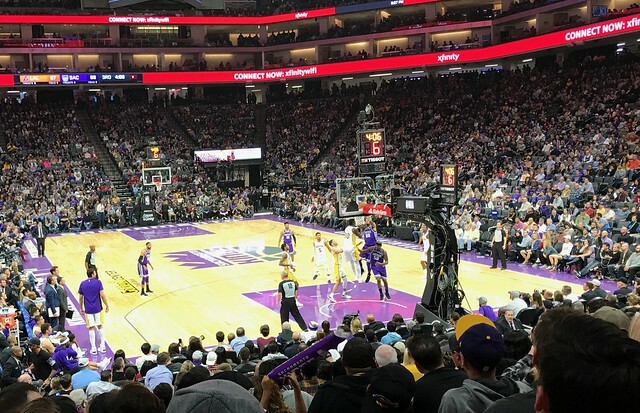 Sharon, Jack and I went to the Sacramento Kings versus Los Angeles Lakers NBA Basketball game. I parked in the Wells Fargo building. We had seats 17, 18 and 19 in row D of section 101. The Kings took the lead late in the first quarter. Leading by as much as 20 points in the fourth quarter, the Kings won the game by the score of 113 to 102. Coming off the bench, Willie Cauley-Stein was the leading scorer for the Kings. He had 26 points on 10 for 14 from the field, 0 for 1 from three and 6 for 8 from the free throw line. Kentavious Caldwell-Pope was the Lakers' leading scorer. He had 20 points on 7 for 12 from the field, 4 for 6 from three and 2 for 2 from the free throw line. I focused on either Fox or Lonzo Ball for most of the game. Fox started. He missed five of his first seven shots, including two airballs. In 23 minutes, Fox ended up with 13 points on 5 for 11 from the field, 2 for 2 from three and 1 for 2 from the free throw line. In 37 minutes, Ball had 11 points on 4 for 8 from the field, 3 for 5 from three and 0 for 2 from the free throw line. He added 7 rebounds and 11 assists. Ball has a very ugly shooting motion. I was very impressed with Bogdan Bogdanovic. He looks like an NBA player. Snipes had texted me on Tuesday night saying that Keith had bailed on him for a class reunion and wondering if Larkin was interested in going. Larkin ended up going with Snipes. We connected with them briefly before the game and then again at half-time. [Note to self], Snipes and I need to get together and catch up! It was a very enjoyable game and evening. Including preseason, the Kings now have 3 wins and 0 losses in games that I have see in person during the 2017-2018 season.